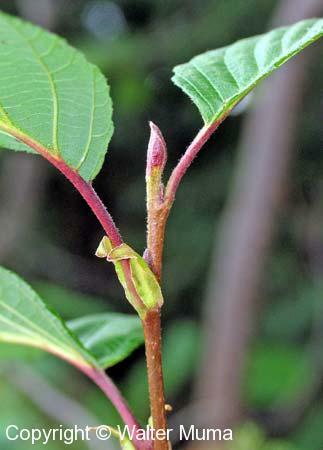 Distinctive features: Shrub; Prominent lenticels (speckles) scattered all over the bark. 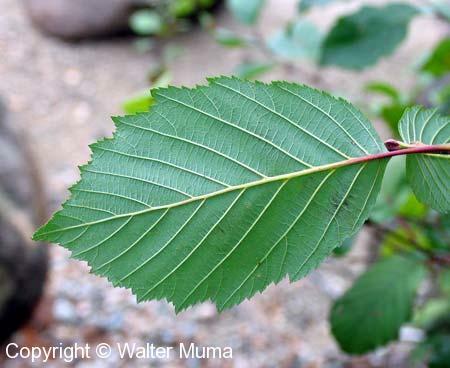  European Black Alder (Alnus glutinosa) - leaves are roundish and indented at the tips. 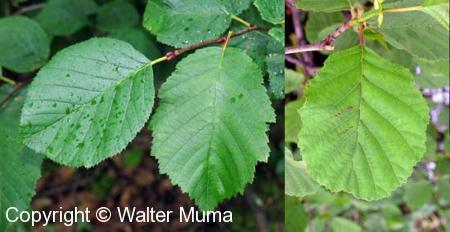  Green Alder (Alnus viridis) - leaves are not double-toothed. Leaves: Alternate, Simple, Toothed; Roundish, alternate, toothed. Trunk: Prominent lenticels (speckles) scattered all over the bark. Habitat: Wet Areas; Wet areas, along stream banks. 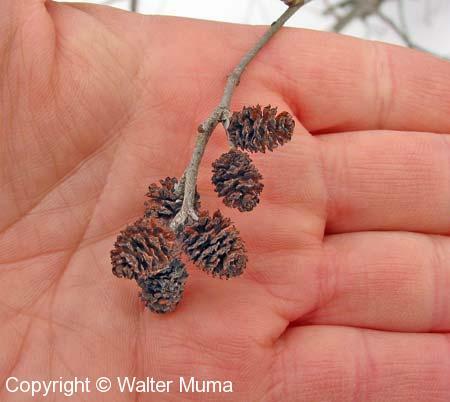 Notes: Easily confused with European Black Alder (Alnus glutinosa). Photographs: 179 photographs available, of which 8 are featured on this page. SCROLL DOWN FOR PHOTOGRAPHS. 1. The tip is pointed, not blunt (European Black Alder (Alnus glutinosa) leaves are blunt-tipped, or even indented at the tip). 2. The edges are double-toothed. Seed catkins. Note the short stalks. European Black Alder (Alnus glutinosa) catkins are on long stalks. Speckled Alder hanging out over a frozen strem in a swamp.